was the first data acquired by my 10" OGS/RCOS Ritchey–Chrétien telescope at New Mexico Skies. M77 at lower left (also called Arp 37) was discovered by Pierre Méchain in 1780. Oriented face-on to us, it is one of the largest galaxies in the Messier catalog, with a central core measuring 120,000 light-years across. Estimated to be 50,000,000 ly from us, this barred Sb-type spiral is a Seyfert galaxy with an extremely active core, emitting both plasma rays and X-rays. Most interesting is its extended arm system, with prominent dark lanes clearly visible. 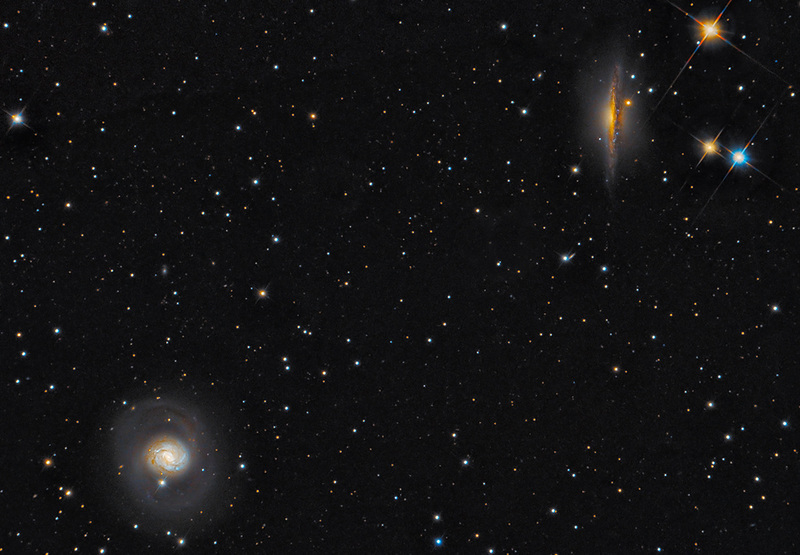 At upper right is NGC 1055, located 30 arcseconds away. This near edge-on is also an Sb spiral, and is gravitationally bound to M77 in a system which includes several other smaller galaxies. This beautiful galaxy and its spectacular dust lane was discovered in 1783 by the great William Herschel.